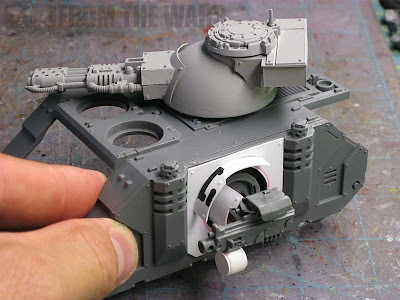 I'm not sure which is easier, trying to build the domed turret or trying to make sponsons that look like the Forge World version seen it the picture there. 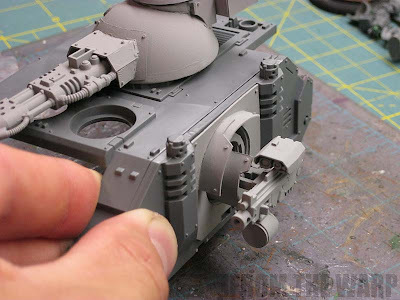 After my first post on building a turret created a huge amount of feedback and the question was asked about the sponsons, I thought I would give it a go to see what I could do. I think I was able to capture some aspects, but failed at others. All in all, it might make for a passable model, but it lacks in some respects. I think with a little more work, I might be able to get better results. It's definitely doable. I started out with a regular chassis. I thought I would see what I could do without any serious conversion work to the model itself. I wanted to limit myself to what I could build or add to a model that was already built. This way, it would be something that someone else could do to an existing model if they wanted to retrofit their own vehicle. Keeping this in mind, it limited what I could build. I think I managed to make the most of what I had, but I'm sure there are ways to improve on this. The current door opening is only so wide. This limited me to the width of my new opening since whatever I built would have to fit in that spot. After a bit of back and forth, I decided I would build a new side armour piece that would fit between the two smoke stacks and would allow me to reshape the opening. My first thought was to make my conversion fit inside the current door shape, but this method ending up being easier. 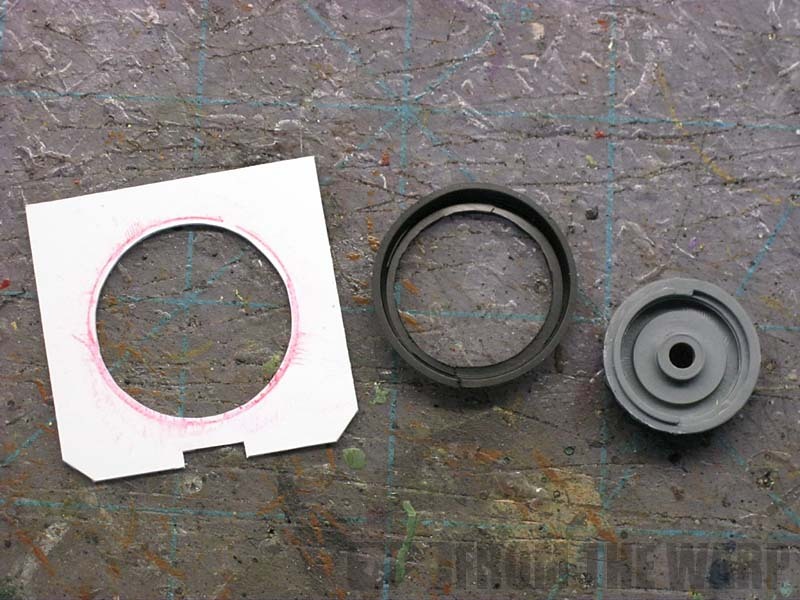 I used a piece of plasticard cut to fit the opening along with a spare 25mm round base and half of a Space Marine bike wheel. If you look at the Forge World model, it has two things that are key. 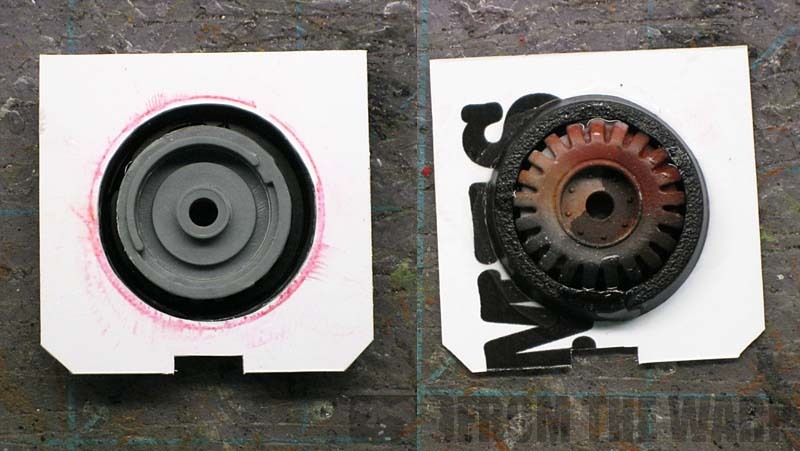 First is the recessed look to the opening and second is the bulk of the weapon mount. By using the new armour plate and attaching the base and wheel half behind it, I was able to create a similar recessed look. The weapon mount is where I come up a bit short overall. Mine lacks the bulk the Forge World version has and it's not as substantial looking. If I were to do it again, I would build the mount out of greenstuff so I could get the "bulk" and then cast the pieces so I had enough for both sides of the vehicle. I think the bulk is a big part of the overall look to the sponsons. Missing it makes the model appear to be lacking in some respects. It still has the feel of it, but not the heft. And again, priming the parts has a way of bringing out the minor surface flaw, but allows you to look at the piece as a whole. All in all, I'm happy with the conversion. 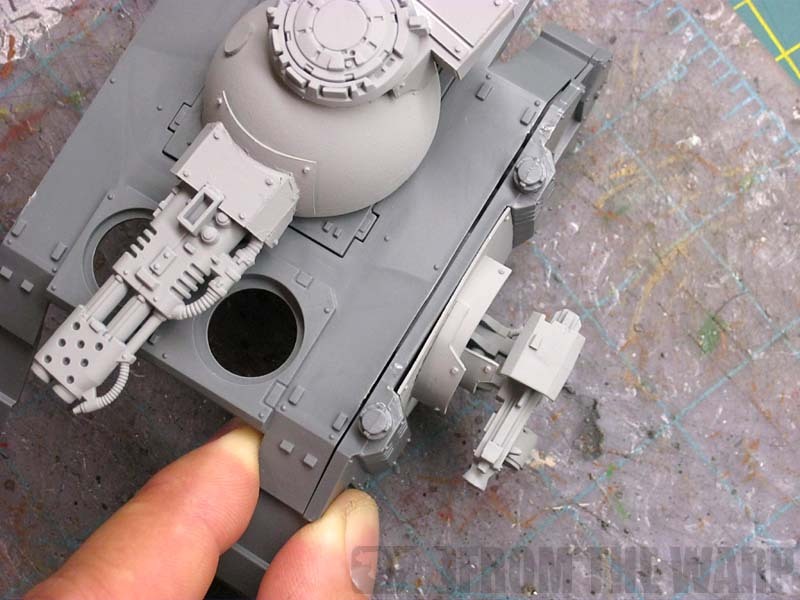 I've learned a huge amount about working with plasticard between this and the turret I did. I don't know if I'll be adding these to my Predator unless I can get that bulked out look I want to achieve. Wow, Ron, with you doing it it looks so easy... It's amazing how you achieve such results with such a small amount of bits... Now I definitely want to try my hands on one meself. I agree with Kai, you make it look way too easy! Great idea using the back of the tire for a mounting place. I probably would have fuddled and tried to make my own, but your idea is much better. This looks really good - the only thing I dont like is that the mounting plate does not seem to be flush and straight. But the converted parts look awesome. Zaphod Beeblebrox: Good catch. That's because it's just sitting there for the time being. If I were actually adding it to the model, it would be glued down and then a little bit of greenstuff would be added along the top edge to disguise the seam so it would look as though it were part of the model. Very good result! Thanks for your job, you get me some ideas for my personal variant. How are you getting even even curvature on the cardstock? Great work, sir! I'd like to know about the even curvature, as well. Maybe add a few layers of plastic card t your mount to get the bulk your looking for. I know Plastic card is not your specialty but your work with it is amazing, and any extra hands on now will help with your future work. oniakki: that works nicely... but like you said, buying the kit for that one piece is a bit overthe top. Ian Logsdon: I know what you mean, rivets make everything better and tie the new pieces into the original model nicely. Green Stuff Industries: If you're wondering about the curve to the armour plates attached to the side of the tank, all I did was mark a curved line in pencil and tried to glue the plasticard to that line. Anon: Thanks. I think the bulking might be accomplished by either boxing out the shape in plasticard or by doing it in greenstuff. I know I keep mentioning it, but I think the bulkiness of the sponsons is important to the overall look/feel in this case. I guess now i dont have any excuse to "borrow" your design to make my own. Interesting you used the inside of a bike wheel. 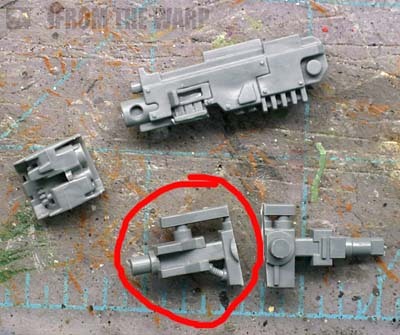 for my own sponsons i've decided to use the underside of a tau gun drone cos its more techy. Anon: Good idea, I hadn't thought of that. Unless you were going for a xerox copy,I would say you scored big time. Remember Different Forge Worlds build things slightly different due to different available resources. It totally works and has a valid fluffy reason why it is slighly different. I would like to ask about new Fellblade super-heavy tank by FW. 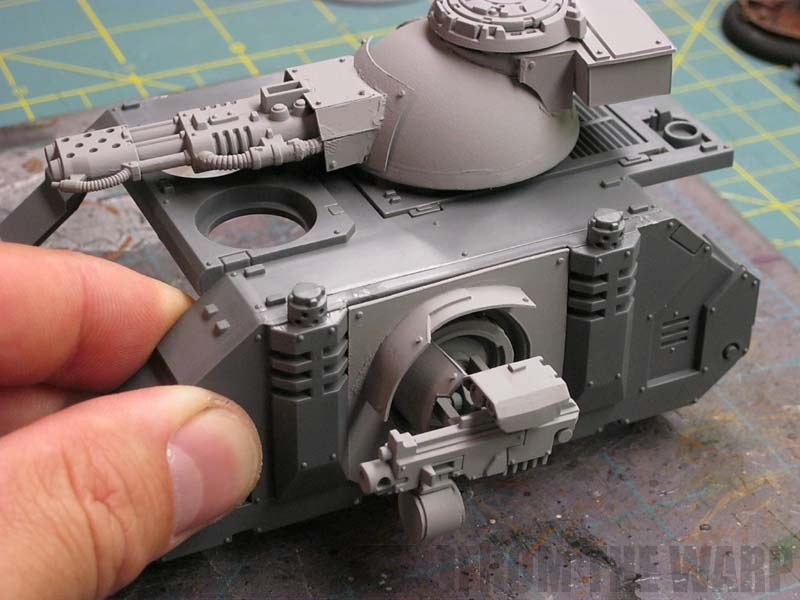 Have you some idea about convertion from standart GW Baneblade or may be Stormlord to this new excelent tank? Corvinvs: No problem. I saw the new model and the first thing I thought was it's a bigger version of the domed turret idea again. 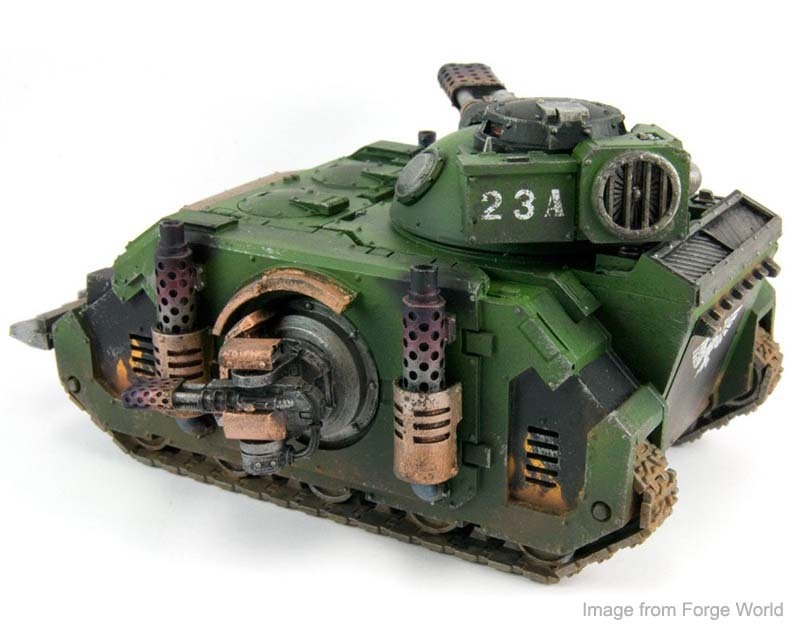 I'm sure you could do it with a Baneblade model, but I don't have one to try it on. It would be a matter of getting the turret built and then getting those old school looking sponsons on there too. Neither looks to be very difficult, but finding a suitable double gun barrel might be a little tough to do. You may have to scratchbuild the box on the back of the turret as well, but again... not impossible. With the sponsons did you use the regular Predator or the Baal Predator? I'm not sure I understand what you mean. I used a regular Rhino chassis and made the side sponson out of plasticard and bits I had.